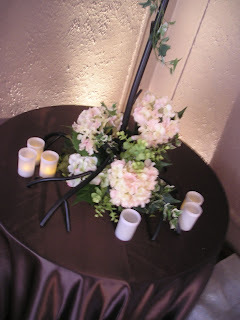 One of the new trends in wedding decor is using natural-looking pieces to create an indoor/outdoor “harmony.” Many T.V. wedding shows, especially “Platinum Weddings,” have featured large trees for use as centerpieces or focus points for a large space. Well, you’re in luck because Sisters Flowers has those trees for your event!! Our black, wrought iron trees stand 6 ft. tall and have a span of 4 ft. The branches of the tree start about 31 inches up the trunk, leaving ample room for guests to converse across a table. They include ten glass hanging votive cups to put candles or LED lights in. 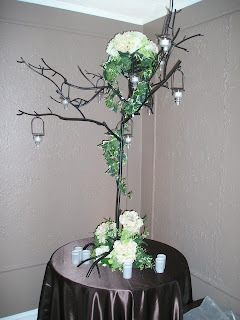 The versatile trees can be modified by adding willow branches and draping ivy, flower arrangements on both the top and bottom, or any combination in between! 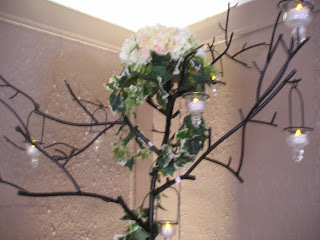 Also a popular look featured on the wedding shows, strings of crystals or glass beads may be hung from the branches. Imagine these trees at your event!! Extra votive candles can be placed at the base of the tree to help bring the light lower. The ambiance these trees give a room makes them truly unique. They can be used on all or part of the guest tables, the place card table, a bar, to frame an entry way or ceremony location, etc. Sisters Flowers rents these trees for $95 each (includes hanging votive cups and standard votive candles). Willow branches and ivy added for an additional $50 per tree. Flowers as shown $185. Contact us today to see if they are available for your event!